Super excited for the new Mini-Mystery! Hi there, I can do the trade for the miss clare hair for my tea cup :) are you online? Hi I can do the trade for the rooms! Great! Are you on now? I know! Summer is so fun and I can't wait for it! But I'm also sad about Summer cause I will have to leave school and friends! :( But maybe I can see them during the Summer! Hi Blossom! I love your profile picture! 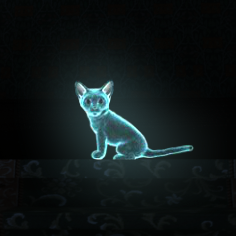 I love kitties and that ghost kitty is so cute!